The first trip of the year took us along numerous winding Welsh A roads, through one unexpected diversion and finally saw us in the small town of Dolgellau, over which the mountain of Cader Idris looms. Until the accommodation fell through we were supposed to be in the Brecons, a little closer to home, but nobody really minded the extra distance when we saw the luxurious bunkhouse with its pool table, comfortable sofas and even a potential bouldering wall in the top bedroom. Unfortunately not all of the furniture was as robust as it could be, as Gaby found out when she sat on a kitchen chair. Friday night passed swiftly with a few drinks, the beginnings of a pool tournament, and discussions about the possible routes for Saturday. On Saturday we departed just after 9am, once Lee had joined us, and drove to the car park at Ty Nant. From there we walked partway up the Pony Path then cut across eastwards towards Llyn y Gadair. 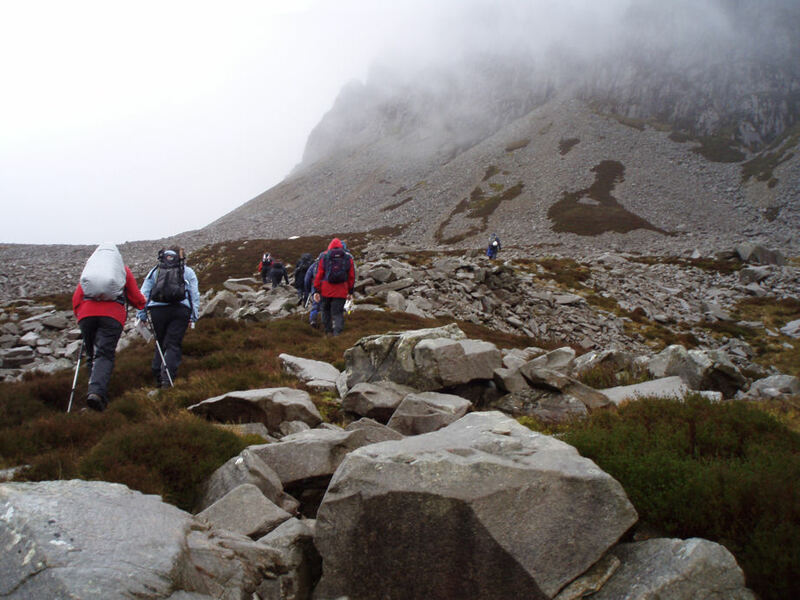 At that point, Andy and Andy left the group to take the more technical route up Cwyfrwy Arete. 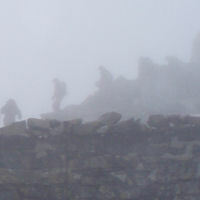 However, as the weather clagged in they missed the start, and ended up on a less technical scramble up to the summit plateau. 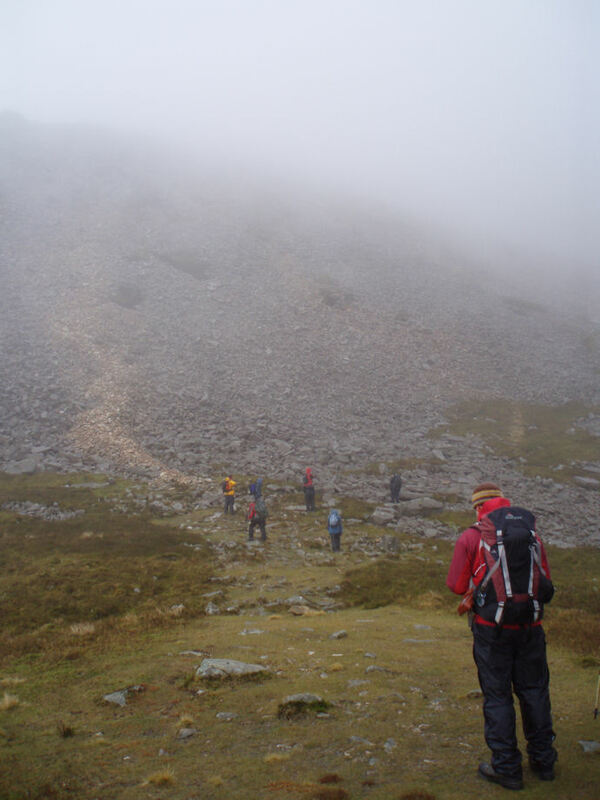 The rest of us battled our way up some interminable scree in rapidly worsening weather. 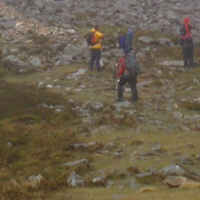 Mike, in his bright yellow waterproof, proved to be a very useful beacon in showing us the correct route, although we weren’t too sure about his novel way of “venting” his waterproof trousers. Once we reached the summit plateau we had lunch in the shelter, and then climbed up the short distance to the actual peak, where we met up with Andy and Andy again. 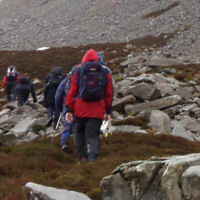 The route down was on the Pony Path, and we made such good time that we were back in Dolgellau to dry out by 3.30pm. This gave some people a chance to wander around the town and perhaps have a sojourn in a coffee shop (sorry, Rhoda and Marion, for eating all the cake). In the evening, large amounts of wine were dumped in a saucepan and heated (who says mulled wine has to be limited to Christmas? ), and Andy M served up a very well-received spaghetti bolognaise, followed by apple crumble courtesy of Marion and Rhoda. The pool tournament continued with standards ranging from flukily brilliant to woeful, often from the same person, and Si claimed a slightly dubious victory at the end of the night. On Sunday morning the weather was still wet. Undaunted, Andy M, Mike, Pam and Martin went off for a couple of hours’ mountain biking at Coed-y-Brenin – they did the 20km MBR circuit, which Andy described as “similar to the North Sea, but with trees”. Special mention has to be made of Andy’s extremely dodgy-looking eyewear. 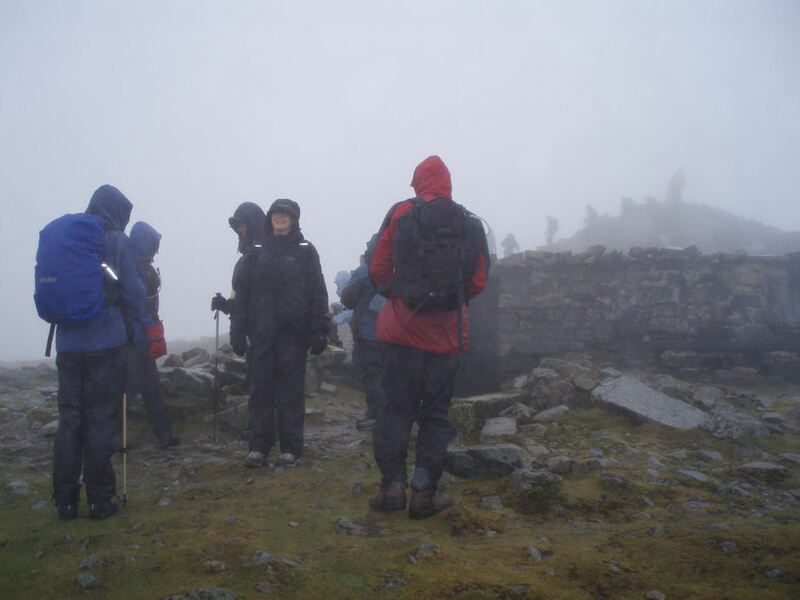 Gaby, Si, Sarah, Rhoda, Jarca and Annie also went to Coed-y-Brenin, and completed the Waterfalls and Goldmines walk – although it was suspected that some of the waterfalls were a bit unscheduled. Meanwhile Dave, Maika, Simon and Marion went to Barmouth and walked around the estuary.